Yet, only a small fraction of them gain traction and attract readers. What’s even more interesting is the fact that out of the tiny fraction of readers, half of them will read the article for only 15 seconds or even less. On the other hand, Podcasts have been showing a steady rise in engagement. The reason is a little obvious, isn’t it? Podcasts simply offer a richer experience, subconsciously engaging the listener with a continuous stream of audio. And, that’s not the only reason. The truth is, listening is simply more convenient. Whether you are driving to work, going for a jog or tired of staring at a screen. You can just sit back, relax and turn on a Podcast and still be able to engage! Now, imagine if you could apply the nature of audio to written content? We thought the obvious approach would be to narrate your own articles. 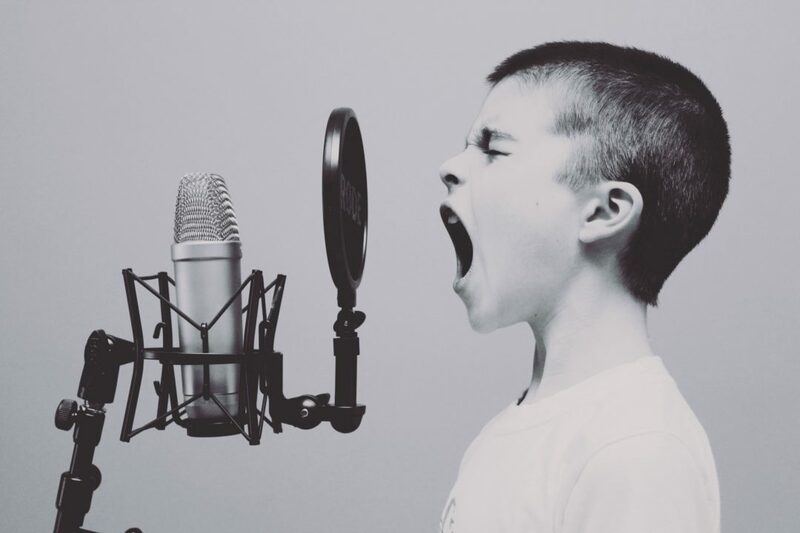 But, for a significant number of people who don’t have the time or aren’t all that comfortable with technology, creating a Podcast can be a very time consuming process. Not to mention the costs involved in buying studio equipment like a professional microphone, editing software, etc. if you publish articles on @medium I seriously recommend you check out @play_ht – turn your article into audio – pretty darn cool. How can writers, authors and bloggers on Medium provide their readers the convenience of ‘listening’ to their articles as podcasts? Being avid Medium readers, this is the bridge we have been trying to build. We built a tool that converts any Medium article to audio using high quality Text to Speech technology so readers can have the convenience of listening. When we launched it on Product Hunt, Play.ht got featured and suddenly was one of the most upvoted products in its category! This is when we realized that there was a gap between readers and convenient consumption of content online. Ever since, we have been trying to fill this gap by making articles listenable and turning them into podcasts. Step 1. Download & Install The FREE Chrome Extension Now! To get started, you need to Download and Install the Free Chrome Extension on your chrome browser. Once you have installed the extension, login to your account and you will find additional buttons on ‘Your Stories’ page. Step 2. Open the draft that you wish to publish and you will see a new ‘Publish With Audio’ button. You can simply click this button and your draft will be published with an audio podcast. Step 3. Click ‘Publish With Audio’ to add The Play.ht Embedded Player on your article! 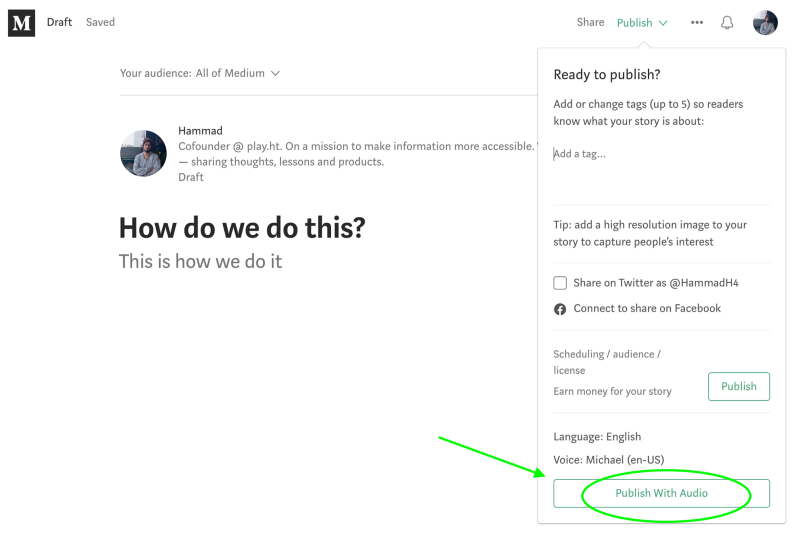 And, if you wish to add audio to an article that you have already published, go to ‘Your Stories’ page and under the ‘Public’ tab you will find an option to ‘Add Audio’ to your published articles. Select the article you wish to turn into a podcast, click on the ‘Add Audio’ button and the embedded player will be added to the article. You can even select multiple articles at the same time! We use the best in class artificial voices to narrate the articles. You can select from 18 languages and 32 different voices for your podcast. Publish your Podcasts on the biggest Podcasting platforms like iTunes and Soundcloud. Creating a podcast on iTunes requires an RSS Feed URL — a link that has information about podcasts and its metadata such as the title, description, etc. and is in XML format. With Play.ht, we generate the link so you can effortlessly publish on iTunes! Check out one of our customers, Melvin who recently published his podcasts on iTunes with Play.ht. He is a Creative Director at RapidGems Studio and Founder of Emm & Enn Art Studio. Since our launch in 2016, we have been getting phenomenal feedback from you guys. We want to thank all of you who have gone through putting the effort of helping us improve Play. So, although we are super excited about this new feature, we are more excited to see what you have as feedback for us this time and what new features/improvements you would like to see next. Our vision is to empower writers, authors and bloggers with an end to end solution for hosting, publishing and distributing their written content as audio across multiple platforms so they can engage better with their audience and provide more value out of their content. Re-use and re-purpose a single piece of written content into a whole new dimension; Podcasts. Boost your SEO and potentially rank you higher in search engines. Add on the value you provide to your audience by increasing its accessibility and allowing readers to multitask. Help your readers consume your written content effortlessly and productively. Convert Your Medium Articles to Podcasts Now! Want Play.ht for your WordPress site? Download The Free Play.ht WordPress Plugin Here!